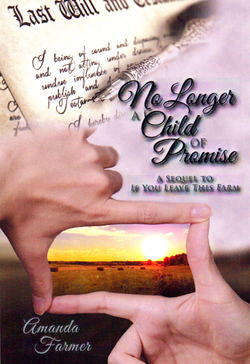 Sequel - No Longer a Child of Promise - "If You Leave This Farm..." & "No Longer A Child of Promise"
Favoritism No Longer A Child of Promise details the continuation and outcome of the personally distinctive story of one Mennonite lady, who's leaving the farm was portrayed in her first memoir, If You Leave This Farm … The Dream Is Destroyed. Can the writer's heart be healed? At the present time I have the following children: Paul Reimer, Amanda Reimer, and Joseph Reimer. I intentionally omit all of my children from this my Last Will and Testament except for the provisions made for Paul Reimer as set forth herein. The omission of all of my children except for Paul Reimer is not occasioned by accident or mistake and is intention. My son, Paul Reimer, has stayed with us on the farm and we would not have been able to hold it together and have the type of assets we have today without his dedication and assistance. He is the one that should reap the benefit of his hard work…. All of my clothing, jewelry, ornaments, automobile or automobiles, books, household furniture and furnishings, and personal effects of every kind and nature used about my person or home at the time of my decease I hereby devise…the same in equal shares to my son, Paul Reimer, and the issue of my son, Paul Reimer, by right of representation… (signed this 8th day of March 1995). I stare at the documents in my hand. It is 2008 and I am reading a signed “Last Will and Testament” of my mother and father. They are mirror images of each other. No, my parents are not deceased. But rather they are under a conservatorship during which time all their legal arrangements have come to light. The shock, the rejection, and the pain that I feel wash over me and almost take my breath away. Echoes of the past reverberate in my mind. It is the summer of 1986. I am 29 years old. I watch Pappy’s retreating back with a sense of despair. His figure clad in green cotton pants supported by suspenders over the usual gray shirt and topped with a Dekalb cap strides purposely and determinedly away from me towards his truck. I do not know this man or respect him any longer. I am at the end of my rope. I have no desire to do anything. I just cannot go on. I sit on a straw bale on this warm sunny summer day for several minutes and try to decide what to do. I am sick to my stomach. The black cloud that always threatens to overtake me descends like a shroud around me. I just want to die. I had not planned to leave my job as the dairy herdsperson on my father’s farm just yet. I have not finished getting the cow records up to snuff. Now, I no longer care. I walk slowly to the two story white farmhouse and up the stairs to my bedroom. Mama is sleeping on the couch downstairs after a night of work at the hospital as a nurse. I pull out Mama’s old suitcase that is stored in my closet and begin to throw the basic items that I will need into it. Then I sit on my bed for minutes at a time trying to decide if I can really go through with this. My mind is in turmoil. Every muscle in my body contracts as fear grips me. I finally snap the suitcase shut and tiptoe down the stairs to the kitchen. Mama is still asleep. Without giving her time to respond, I turn, pick up the suitcase, and hurry towards my car. I waste no time in throwing the suitcase into the backseat and plunking myself behind the wheel. I do not want to allow Mama any time to try to stop me. Having been jerked from her slumber by my sudden announcement, Mama gathers herself up to follow me. I see her standing on the mud room entry steps as I drive away. Her Mennonite style dress covered with an apron and her uncombed hair wave in the breeze as she gazes after me in bewilderment. Just a little over a year later in 1987, I am jolted awake at 2:30 p.m. from my day sleeping after a previous night shift at the hospital as a nurse by the ringing of the telephone. “Hello,” I groggily intone into the phone. Now I am wide awake. My mind races. I am torn as to how to respond. “I don’t really want to get involved,” I tell him. “Just get me out of here and give me a ride to the bus station. I can take care of myself from there,” he pleads. I pause while I try to decide what to do. I know how hard it was for me to leave and how everyone was reluctant to help for fear of Pappy. If I don’t help him, no one else is going to. Certainly, Joe deserves to escape as much as I did. I am shaking as I hang up the phone. I know there will be ramifications for my helping him. I also have no idea if Pappy and Mama are even aware of his plan to leave. I try to swallow the lump in my throat as I drive up the long driveway and park beside the old box shaped farmhouse the next afternoon. I am queasy and lightheaded. Joe, a well-built muscular young man, comes out of his bedroom and down the stairs carrying the infamous suitcase. Pappy and Mama sit in the living room sobbing. The tears start to roll down my cheeks too. I feel sorry for these people who are my parents. They are crying because their children have “abandoned” them. They are heartbroken that their dream of us all farming together has been totally dashed. “How are we going to make it now?” is their plaintive question to us. I do not answer. There is no benefit in pointing out that their inability to transition from treating us like children to treating us like adults has brought about this result. I need to get out of here. “Come on. Let’s go.” I nod at Joe, my 29 year old brother, and jerk my head towards the door. We climb into the car and drive away. Joe and I have both chosen to leave the unrealistic demands of life on the farm under our father’s tight control. We are leaving him and our older brother, Paul, to manage and work the farm alone. Yes, my father told me and Joe that if we left the farm we would not get anything from it, but leaving the farm to Paul is a different thing than totally disinheriting us. How had we come to this point as a family that my parents’ final message to us is one of abandonment and of completely disowning us?